If you’re a programmer interested in joining a YC startup, apply to Triplebyte and we’ll match you with the ones you’d be the best fit for. The types of programmers that each company looks for often have little to do with what the company needs or does. Rather, they reflect company culture and the backgrounds of the founders. It’s nearly impossible to judge these preferences from the outside. At most companies, however, non-technical recruiters reject 50% of applicants by pattern matching against these preferences. This is a huge frustration for everyone involved. Across the companies we work with there are several notable trends. First, companies are more interested in engineers who are motivated by building a great product, and less interested in engineers with pure technical interests.This is at odds with the way the majority of programmers talk about their motivations. There’s a glut of programmer interest in Machine Learning and AI. Second, companies dislike programmers with enterprise backgrounds. Our data shows that companies are less likely to hire programmers coming from Java or C# backgrounds. These results show extrapolation from insufficient data on the part of many companies. Talent can be found among programmers of all backgrounds. We’re mapping the preferences across all YC Companies in more detail, and encouraging companies to consider people they would normally reject. In the meantime, programmers looking for jobs with YC companies may want focus more on product and be sure to mention experience outside of Java and C#. My co-founders and I have been running a recruiting company (Triplebyte) for the last 6 months. We interview programmers, and help the best ones get jobs at YC companies. We do our interviews without looking at resumes (in order to find great people who look bad on paper), and then see feedback on each engineer from multiple companies. This gives us a unique perspective on who YC companies want to hire. Mapping these preferences, it was clear, was key to helping engineers find the right startups. If we could route programmers to companies where their skills were valued, everyone would win. To that end, we’ve spent the last two months doing detailed interviews with CTOs and lead recruiters at the top 25 Y Combinator companies. In this blog post I’m going to write about what we learned from talking to these companies and sending them engineers. It’s interesting, and I hope useful for people applying for programming jobs. To map the preferences of the top YC companies, we wrote paragraphs describing 9 hypothetical programmers, embodying patterns we’d seen from running 1000+ interviews over the last 6 months. These range from the “Product Programmer” who is more excited about designing a product and talking to users than solving technical challenges (we internally call this the Steve Jobs programmer) to the “Trial and Error Programmer” who programs quickly and is very productive, but takes an ad hoc approach to design. In reality, these profiles are not mutually exclusive (one person can have traits of several). We then set up meetings with the founders and lead recruiters at the top 25 YC Companies. In the meetings we asked each company to rank the 9 profiles in terms of how excited they were to talk to people with those characteristics. The grid that follows shows the results. Each row shows the preferences of a single (anonymized) company. Each column is a hypothetical profile. Green squares means the company wants to interview engineers matching the profile, red means they do not. Empty squares are cases where the founders’ opinions were too nuanced to be rounded to interest or lack of interest. The first thing that jumps out is the lack of agreement. Indeed, there’s no single company interested (or disinterested) in all 9 profiles. And no profile was liked (or disliked) by more than 80% of companies. The inter-rater reliability of this data (a measure of the agreement of a group of raters) comes out at 0.09. This is fairly close to 0. Company preferences are fairly close to unpredictable. The impact of these preferences on programmers, however, is totally predictable. They fail interviews for opaque reasons. Most companies reject a high percentage of applicants during a recruiter call (or resume screen). Across the 25 companies we interviewed, an average of 47% of applicants were rejected in this way (the rate at individual companies went as high as 80%, and as low as 0%). The recruiters doing this rejecting are non technical. All they can do is reject candidates who don’t match the profile they’ve been taught to look for. We’ve seen this again and again when we intro candidates to companies. Some companies don’t want to talk to Java programmers. Others don’t want academics. Still others only want people conversant in academic CS. We’ve seen that most engineers only have the stomach for a limited number of interviews. Investing time in the wrong companies carries a high opportunity cost. I don’t want to be too hard on recruiters. Hiring and interviewing are hard, shortcuts must be taken to keep the team sane, and there are legitimate reasons for a company to enforce a specific engineering culture. But from the point of view of programmers applying for jobs, these company preferences are mercurial. Companies don’t advertise their preferences. People who don’t match simply apply, and are rejected (or often never hear back). There is some agreement among companies, however, and it’s interesting. There’s more demand for product-focused programmers than there is for programmers focused on hard technical problems. The “Product Programmer” and “Technical Programmer” profiles are identical, except one is motivated by product design, and the other by solving hard programming problems. There is almost twice as much demand for the product programmer among our companies. And the “Academic Programmer” (hard-problem focused, but without the experience) has half again the demand. This is consistent with what we’ve seen introducing engineers to companies. Two large YC companies (both with machine learning teams) have told us that they consider interest in ML a negative signal. It’s noteworthy that this is almost entirely at odds with the motivations that programmers express to us. We see ten times more engineers interested in Machine Learning and AI than we see interested in user testing or UX. Experience matters massively. Notice that the Rusty Experienced Programmer beats both of the junior programmer profiles, in spite of stronger positive language in the junior profiles. It makes sense that there’s more demand for experienced programmers, but the scale of the difference surprised me. One prominent YC company just does not hire recent college grads. And those that do set a higher bar. Among our first group of applicants, experienced people passed company interviews at a rate 8 times higher than junior people. We’ve since improved that, I’ll note. But experience continues to trump most other factors. Recent college grads who have completed at least one internship pass interviews with companies at twice the rate of college grads who have not done internships (if you’re in university now, definitely do an internship). Experience at a particular set of respected companies carries the most weight. Engineers who have worked at Google, Apple, Facebook, Amazon or Microsoft pass interviews at a 30% higher rate than candidates who have not. If you’re looking for a job as a programmer, you should pay attention to these results. Product focused programmers pass more interviews. Correlation is not causation, of course. But company recruiter decisions are driven largely by pattern matching, so there is a strong argument that making yourself look like candidates who companies want will increase your pass rate. You may want to focus more on product when talking to companies (and perhaps focus on companies where you are interested in the product). This is a way to stand out. Similarly, if you’re a C# or Java programmer applying to a startup, it may behoove you to use another language in the interview (or at least talk about other languages and platforms with your interviewer). Interestingly, we did talk to two YC companies that love enterprise programmers. Both were companies with founders who have this background themselves. Reading bios of founders and applying to companies where the CTO shares your background is probably an effective job-search strategy (or you could apply through Triplebyte). If you run a startup and are struggling to hire, you should pay attention to these results too. 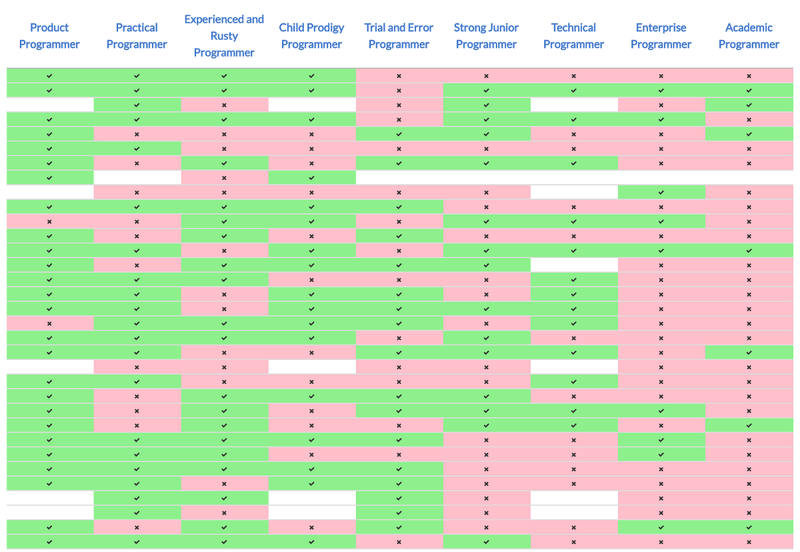 Our data clearly shows startups missing strong candidates because of preconceptions about what a good programmer looks like. I think the problem is often extrapolation from limited data. One company we talked to hired two great programmers from PhD programs early on, and now loves academics. Another company had a bad PhD hire, and is now biased against that degree. In most cases, programming skill is orthogonal to everything else. Some companies have legitimate reasons to limit who they hire, but I challenge all founders and hiring managers to ask themselves if they are really in that group. And if you’re hiring, I suggest you try to hire from undervalued profiles. There are great Ph.Ds and enterprise C# programmers interested in startups. Show them some love! YC Startups disagree strikingly about who’s a good engineer. Each company brings a complex mix of domain requirements, biases, and recruiter preferences. Some of these factors make a lot of sense, others less so. But all of them are frustrating for candidates, who have no way to tell what companies want. They waste everyone’s time. I’m excited about mapping this. Since we started matching candidates based on company preferences (as well as candidate preferences), we’ve seen a significant increase in interview pass rates. And we only just completed the interviews analyzed in the post. I’m excited to see what this data does. Our planned next step is to not only interview founders and recruiters at these companies, but also have the engineers who do the bulk of the actual interviewing provide the same data. Our goal at Triplebyte is to build a better interview process. We want to help programmers poorly served by standard hiring practices. We’d love to have you apply, even if — or especially if — you come from one of the undervalued groups of programmers mentioned in this article. We’d also love to get your thoughts on this post. Send us an email at founders@triplebyte.com. Thanks to Jared Friedman, Emmett Shear and Daniel Gackle and Greg Brockman and Michael Seibel for reading drafts of this. Astute readers will notice that there are more than 25 rows in the graph. This is because we’ve recently added these questions to our onboarding flow for new companies we work with. If you run a YC Company, you can log into Triplebyte with your company email address, and add this data (we’ll use it to send you more candidates). I calculated this using Fleiss’ kappa. This measures the agreement between a number or raters, with -1 being perfect disagreement, 0 being the agreement that would result from random coin tosses, and 1 being perfect agreement.